Philip joined Watsi on April 22nd, 2014. 8 other people also joined Watsi on that day! 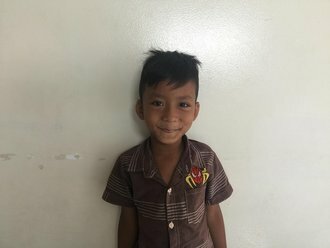 Philip's most recent donation traveled 8,800 miles to support Sing, a boy from Cambodia, to fund tonsil and adenoid surgey. Philip has funded healthcare for 38 patients in 10 countries. Sing is a first grader. He likes to study mathematics and wants to be a police officer when he grows up. He has an older brother and an older sister. He likes playing games and watching TV. For the past year, Sing has had a recurrent infection. He experiences nasal obstruction, runny nose, sneezing, and snoring. Sing needs to have a tonsillectomy and adenoidectomy surgery to get rid of the infection and make him well again. This will allow him to breathe and sleep well and return to school. Fortunately, he is scheduled to undergo surgery on April 30. Now, he needs help raising $221 to fund this procedure. Evelyne is a five-year-old girl from Kenya. She's the second born in a family of three children. Evelyne suffers from congenital angular deformity, a condition in which the joints or bones themselves bend abnormally. Her bones are also very weak and keep breaking. Because of her condition, Evelyne cannot walk or stand on her own, making it difficult for her to play with other kids or attend school. Evelyne has been treated with casting, but her condition has not improved. On June 22, Evelyne will undergo corrective surgery to treat her condition. Our medical partner, African Mission Healthcare Foundation, is requesting $1,165 to cover the cost of the surgery, five nights of hospital stay, medication, and medical supplies. “My joy is to see my daughter rising up and walk after surgery. I would also want to see her going to school. 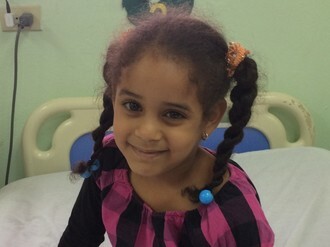 Due to the struggles I am experiencing, I would request for your help,” says Evelyne's father. Loyce is a 14-month-old baby girl from Hakikome in the rural hills of Uganda. She lives with her parents, and her mother is expecting another baby in the coming months. While Loyce used to enjoy waking and playing with other children, malnutrition has dramatically reduced her mobility. Due to her pediatric malnutrition, Loyce has experienced diarrhea, weight loss, and severe lethargy. Our medical partner, The Kellermann Foundation, is requesting $316 to fund treatment for Loyce, which she is scheduled to receive on June 8. This covers a ten-night hospital stay, medications, and provision of vital nutrients. “I thank the donors for the support. I am hoping that the hospital will treat my daughter to recover and get better. I was so much worried about the costs, and I am so grateful that there is such support," shares Loyce's mother. Following her daughter's treatment, her mother wishes to take Loyce home and hopefully send her to school one day. Nylah is a newborn from Kenya who was born with a condition known as spina bifida. Spina bifida results from an incomplete formation of the spinal cord, and the condition has caused Nylah to experience weakness in her lower limbs, develop an irritable nature, and lack the ability to feed properly. Because of her condition, Nylah is at risk of developing a tethered spinal cord, a hunched back, lower limb paralysis, and infections of the exposed nerves and tissues. Our medical partner, African Mission Healthcare Foundation, is requesting $1,097 to fund spinal surgery for Nylah. The procedure is scheduled to take place on June 23 and, once the gap in Nylah's spinal cord is closed, will hopefully allow Nylah to proceed along a healthy developmental trajectory. Nylah's mother says, “We are certain that Nylah will get well and whatever treatment that she receives will be of help to her well-being." Samuel is a four-month old baby boy from coastal Kenya. He is the only child of his parents, who love him dearly. Samuel was born prematurely at 32 weeks. One month before he was born, he was diagnosed with hydrocephalus, a condition where excess cerebrospinal fluid accumulates in the brain and causes the skull to swell. If left untreated, Samuel will likely suffer brain damage and lose his sight. Doctors recommend that Samuel have surgery to drain the excess fluid from his head and reduce the pressure in his brain. However, because Samuel's parents are subsistence farmers, they can't afford the operation. On August 2, Samuel will undergo surgery. Our medical partner, African Mission Healthcare Foundation, is requesting $685 to fund the treatment. “It pains us to see our only child in pain," says Samuel's mother. "We long to have a happy child in our home." Meet Gideon. He is a playful and happy boy. Gideon’s head has been abnormally enlarging since he was two years old. Due to the severity of his hydrocephalus, Gideon is unable to walk properly on his own. Fortunately, he is scheduled to undergo brain surgery to correct the condition on August 2. We hope that after treatment, Gideon’s head will return to normal size, giving him better balance and preventing further damage to his brain. His family needs help raising $728 for surgery. Both his parent are farmers and have four other children. His mother says, “Please help my son get better. It really hurts me that he is constantly sick." “I just want to see my daughter laugh and play again,” shares Shallon’s mother. Shallon, an 18-month-old baby girl from Uganda, has been sick for two months. She is extremely thin and weak, experiences diarrhea, and has lost her appetite. Her mother brought her to Bwindi Community Hospital, our medical partner's care center, where she was diagnosed with malnutrition. In addition to the immediate dangers that Shallon faces from a compromised immune system, she runs the long-term risks of compromised physical and cognitive development. Before she fell ill, Shallon was a very different girl. She was a lively child who liked running and playing. She would mimic everything she saw her mother do, from rinsing dishes and washing her father’s hands to digging in the garden. In order to restore her to this state of health and happiness, Shallon’s doctors need to provide her with emergency nutritional supplies, such as therapeutic milk and dextrose. On April 16, they will also run a number of lab tests to evaluate her body’s needs and to determine whether there are any additional causes for Shallon’s lack of appetite. Shallon’s parents—who provide food for the family through subsistence farming and earn a small income making bricks and baskets to sell—do not have enough money to pay for their daughter's medical care. But for $316, we can cover the costs of Shallon’s lab tests and nutritional supplies, as well as her ten-day stay at the hospital and transportation home. Let’s make sure Shallon can once more become the energetic child that her parents remember. “I am so grateful for the help,” says Shallon’s mother. Elineris is six years old and lives in a rural community in the Dominican Republic with her parents and one older sister. Her parents are both farmers. She is in kindergarten and loves everything having to do with princesses. Elineris was born with a cardiac condition called ventricular septal defect, in which a hole exists between the two lower chambers of her heart. Blood leaks through this hole without first passing through her lungs to obtain oxygen, leaving her sickly and weak. Although Elineris is not Haitian, our medical partner, Haiti Cardiac Alliance, is collaborating with their partners in the Dominican Republic to offer treatment to Dominican children. Elineris will be one of the first children to receive this care. First, Elineris will undergo a full cardiac assessment on February 11. This assessment will include physical exams, labs, and an overnight stay at the hospital. Haiti Cardiac Alliance is requesting $1,500 to fund these procedures. Funding for Elineris also covers the cost of medications and social support for her and her family. Gift of Life International is contributing $7,000 to cover additional costs associated with Elineris's surgical care. "We would like to say thank you to everyone who is helping Elineris. We never imagined she would ever have this chance" says her mother. Kris is a two-year-old boy who lives with his grandmother in a wooden house. His father is a tricycle driver, and he has difficulty providing enough for the family. As a result, Kris Robert is much lighter than other children his age. He has been diagnosed with severe acute malnutrition. Kris began $268 malnutrition treatment on October 19. He is being treated by International Care Ministries (ICM), a Watsi medical partner. One out of five children under five in ICM communities is either severely or moderately acutely malnourished. Worldwide, poor nutrition is associated with nearly half of all deaths in young children. In remote communities and urban slums of the Philippines, the lack of clean water and unclean environments add risk to potentially fatal childhood diseases. ICM’s Home-Based Feeding program provides nutrient-enriched food packs to ensure malnourished children get additional food to regain normal weight and achieve optimum physical and mental development. After identifying a child as malnourished, staff and community volunteers make weekly visits to monitor this child’s progress. To help sustain the health of the child, ICM's professional staff educate the mother, guardian, or other family members about proper nutrition, sanitation, hygiene, and organic vegetable gardening. Kris's grandmother says, "I hope Kris will recover from malnutrition." Two-year-old Janbern lives in the Philippines with her parents and five siblings. They live in a house made of bamboo with a roof made of galvanized iron. Janbern is an active little girl who loves to play with her siblings. Unfortunately, Janbern's parents cannot afford to give her the diet she needs to stay healthy. As a result, Janbern is severely malnourished. She requires immediate treatment to prevent delays in her mental and physical development. 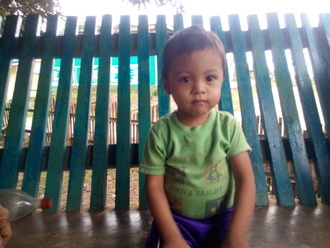 Janbern began $268 malnutrition treatment on October 19. She is being treated by International Care Ministries (ICM), a Watsi medical partner. ICM will supply Janbern with nutrient-enriched food packs to help her reach a normal weight for her age. The nourishment will also ensure that she achieves optimum physical and mental development. Janbern will receive weekly visits from ICM staff and community volunteers to check up on her progress in the program. Additionally, staff will educate her parents about ways to sustain her health in the future. Janbern's mother hopes that her daughter will finish school and have a job one day. Let's help fund this important treatment program! Daw Kyi is a 60-year-old Burmese woman who has lived in a refugee camp in Thailand since 2000. In 1999, Daw Kyi’s husband passed away, leaving her with one son. When an illness paralyzed one side of her son's body, the two traveled to the refugee camp for free treatment. Daw Kyi's son received successful treatment, but they remain in the refugee camp to this day because they cannot afford to return home. 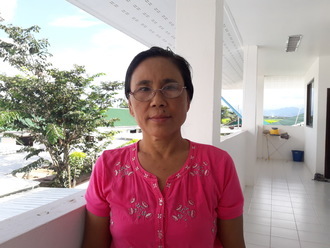 A few years ago, Daw Kyi began experiencing uncomfortable symptoms in a sensitive area. These symptoms disrupted her work as a day laborer planting rice or harvesting corn. Despite learning that she needed surgery, Daw Kyi could not afford treatment. Now, Daw Kyi has difficulty walking or standing for long periods of time. She has lost her appetite, and she sleeps poorly at night. Her symptoms prevent her from working. Fortunately, on October 19, 2016, Daw Kyi underwent a total abdominal hysterectomy with Watsi's medical partner, Burma Border Projects. This procedure should prevent further pain and discomfort. She needs help to pay her $1,500 healthcare costs. "When I am well enough," says Daw Kyi, "I will make and sell snacks as I used to do.” Let's help Daw Kyi return to her normal lifestyle!